Oppo will be launching its latest smartphones, the Find 7 and Find 7a, this Wednesday. Interest in the Chinese company’s devices have hit an all-time high since they officially announced its arrival in Malaysia three months ago, and it looks like Oppo Malaysia wants to take it several notches higher by launching a “Guess the Price” contest on its Facebook page. In case you were wondering, yes, another Chinese company did hold a similar contest just weeks ago. Huawei Malaysia launched a “Guess the Price” contest for its new Honor 3C smartphone, and despite laying some (eventually misleading) hints here and there, it turned out to be a spectacularly cheap phone for its specs. 1. Like the official Oppo Malaysia Facebook page. 2. Like and Share this post with the message: “The OPPO Find7 will be launching in Malaysia and I would like to guess the retailing price for Find7 is … “. Oppo Malaysia has also noted that the final price will end with RM98. Each contestant just can submit one price. 3. Remember to set your Share to public and include #OPPOfind7malaysia at the end, so the post can be seen by Oppo Malaysia. 4. One lucky contestant will be chosen to win a brand new OPPO Find 7a. 5. Contest period : 3rd May 2014 to 7th May 2014 @ 16.30. 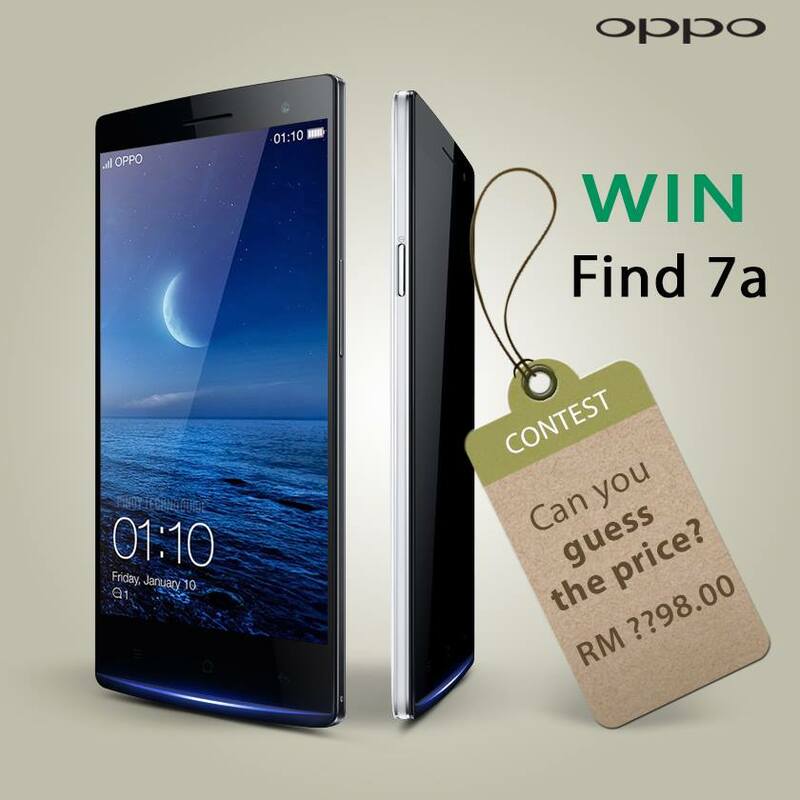 To be clear, Oppo Malaysia wants you to guess the retail price of the Find 7, but will reward the winner with a Find 7a. After all, the company has already announced that the retail price of the Find 7a will be RM1598. Considering that the Find 7 features three major upgrades in specs compared to the Find 7a (processor, RAM and display resolution), it will be fascinating to see what’s the final price for the Oppo Find 7 in Malaysia. Need a tip for the retail price of the Find 7? We don’t know it for ourselves just yet, but here’s something to help you make a calculated guess. In China, the Find 7a is priced at 2998 Yuan, which is about RM1590 – very, very near to the RM1598 retail price that Oppo Malaysia has set. The Find 7? It’s not available even in China just yet, but it’s priced at 3498 Yuan – about RM1850.